The purpose of writing a Last Will and Testament is to make sure that you – and not an anonymous probate court judge – have control over the distribution of your property after your death. If one or more family members disputes the instructions in your will, however, then it is possible that a probate court judge may decide how your assets will be distributed. Obtain qualified legal advice regarding your estate plan. Estate planning has become a popular “do it yourself” legal task, but you should at least consider having your will reviewed – if not written – by a qualified estate planning lawyer. Writing your will with the help of an estate planning attorney will also ensure that your will is a properly executed and valid legal document. Don’t delay estate planning. Plan your estate while you are in good health – “of sound mind and body.” If you create your will while your physical or mental health is failing, your will becomes vulnerable to claims that it is invalid due to your lack of mental capacity. Consider a no-contest clause. A no-contest clause (also called an in terroreum clause) in a Last Will and Testament disinherits anyone who contests the will. Keep in mind, though, that no-contest clauses are valid in some states but not in others. Consider using trusts. Trusts are becoming more widely usedin estate planning , and are useful for various situations. 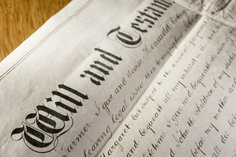 A will is a public document once it is filed in probate court, and the public nature of the document can give rise to disputes and will contests. In contrast, a revocable living trust is a personal and private document that does not have to be filed as a public record. Furthermore, lifetime trusts can be used to provide financially for “troublesome” beneficiaries who might otherwise spend through their inheritance. Lifetime trusts are flexible and can link financial inheritance to the accomplishment of goals that you set forth in the trust documents. Write your will independently. To avoid claims of undue influence after your death, make sure you write your will in circumstances that are clearly free from interference by family members or other beneficiaries. Avoid having beneficiaries serve as witnesses, for example, and don’t allow beneficiaries to attend your meetings with your estate planning attorney. This is especially important if you are under the care of a family member who is also a beneficiary. Be of sound mind and body. At the time you write and sign your will, you can ask your physician to perform a physical examination and certify that you are mentally competent to execute your will. Another option is for your attorney to ask you a series of questions before you sign your will and document that the questions were asked and answered. It may also be a good idea to make a video recording of the process of signing your will, as another way to prove mental competency. Answer your family’s questions. Consider sharing your intentions with your family and other beneficiaries. If you explain the reasons for the decisions you made regarding bequests, you may help prevent will contests after your death. Instead or in addition, you may write a letter to your beneficiaries that will be read at the same time your will is read. Keep your will dust-free. Once your Last Will and Testament and other estate planning documents are complete, don’t just file and forget them. Review your will with an attorney at least once a year and make any necessary changes in a timely manner.